Coal mine bankruptcies: Climate hawks should not be too gleeful about the state of coal. Coal Companies Are Hurting. But the Coal Industry Is Not Dying. Climate hawks must realize that bankruptcies aren’t the way to a lower-carbon future. 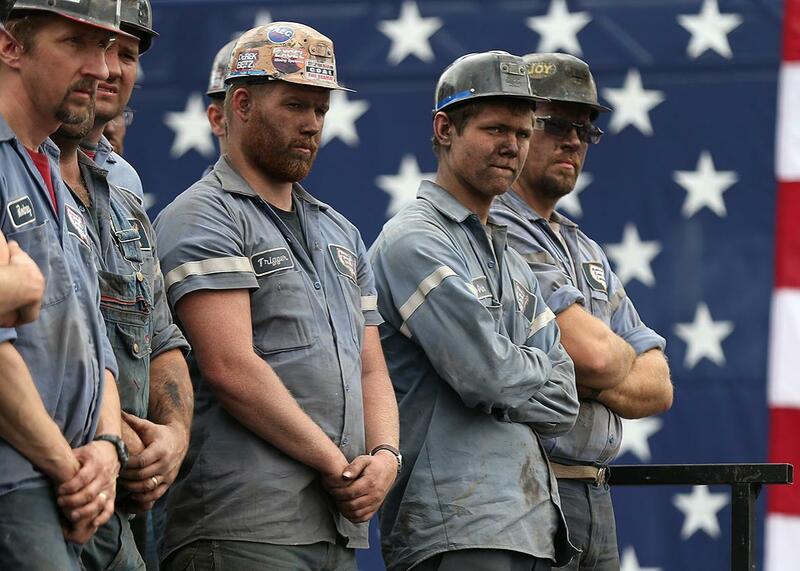 Coal miners look on as Republican presidential candidate Mitt Romney speaks during a campaign rally at American Energy Corportation in 2012 in Beallsville, Ohio. Coal production is falling in America—just not by quite the amount you would expect given the financial stress hitting the industry. According to Bloomberg Intelligence, the number of working coal mines in the U.S. has fallen nearly 40 percent in the past 10 years. But those that remain open are still quite productive. According to the Energy Information Administration, total annual coal production fell about 14 percent between 2008 and 2014. In the first seven months of 2015, production is down only 8 percent from the first seven months of 2014. The slightness of these declines tells us that the market for coal is very different than the market for coal stocks and securities. While nobody wants to buy the publicly traded shares of coal companies, plenty of people still want to buy coal for industrial use. As this chart shows, use of coal in the electricity sector, which accounts for about 92 percent of total U.S. coal consumption, fell by about 14 percent in the first five months of 2015 compared with 2014—largely because power plants are switching to cleaner-burning and cheaper natural gas. But although the market for coal stocks has contracted sharply, coal mines won’t shut down simply because their parent companies are in bankruptcy. America has what is by international standards a very forgiving bankruptcy code and system. It recognizes that the best way to make creditors whole is to keep the business operating, cut debts, and encourage new lenders and investors to provide capital. The process of converting debt to equity happens relatively quickly and without stigma. Once a company files for bankruptcy protection, a robust and highly functional industry—courts, judges, lawyers, consultants, specialized lenders, distressed debt investors—kicks into gear to ensure that companies with valuable assets keep operating until new owners can be found for the whole business or for parts of it. Sure, plenty of businesses liquidate when they go bust—your neighborhood restaurant, electronics chain Circuit City. But many others keep operating and restructure. And that’s precisely what is happening with many coal companies. Patriot Coal, which filed for bankruptcy protection in May, agreed to sell most of its mines to Blackhawk Mining LLC. Going forward, coal will continue to be mined at the rate the global market demands—just under a different capital structure. And the new owners will have the same incentives as the old owners to fight regulations and lobby against emission standards. Unless activists acquire coal mines on the cheap out of bankruptcy and permanently shutter them, a series of bankruptcies alone will not lead to sharply reduced coal mining. In theory, a billionaire like George Soros or Tom Steyer could wade into bankruptcy court, pick up the assets of bankrupt coal companies for pennies on the dollar, and then shut them down entirely—and thus ensure that the coal will stay in the ground. There is something of a middle ground, however. The bankruptcies may lead to new owners that decide to operate the mines in a more environmentally friendly manner and create a new business model for coal. For example, Patriot Coal in August announced a prospective deal whereby the Virginia Conservation Legacy Fund, a nonprofit that works on sustainability issues, would acquire some of Patriot’s West Virginia mines. The fund would keep operating the mines while simultaneously reclaiming and reforesting land. If it could lash together carbon credits it receives for reforestation with coal production, the VCLF says it could create a form of coal that utilities could burn while still complying with new emission standards.